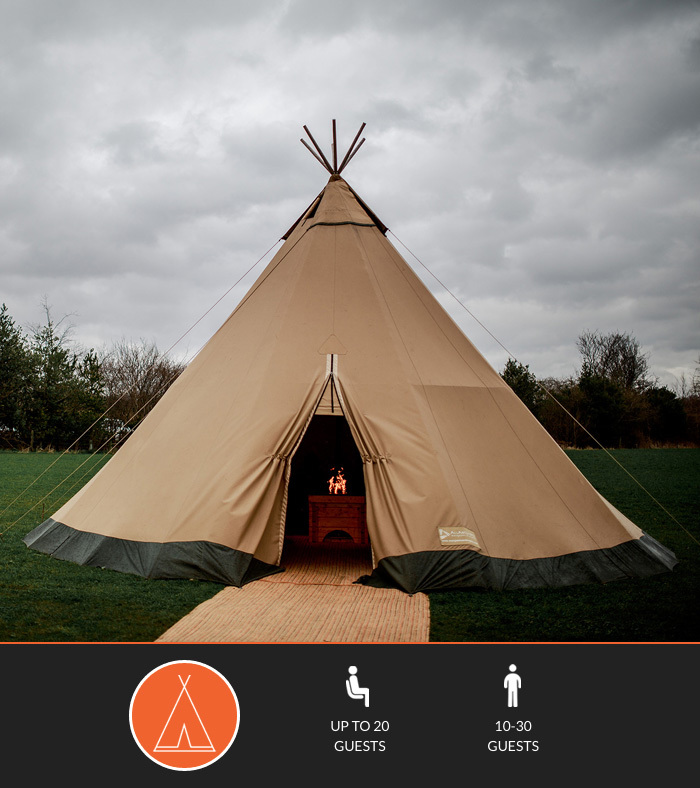 Tipis, tepee, or teepee – there’s actually no wrong or right way to spell it! Tipis were traditionally made of animal skins upon wooden poles and used by people of the Great Plains and Canadian Prairies of North America, and were built to be durable throughout all kinds of weather conditions. Our tipis are built for the exact same purpose – to keep you toasty in the colder months and cooler in the warmer seasons! The word ‘tipi’ actually comes from the Lakota language: a language used by Native American tribes spreading North and South Dakota – the word ‘thipi’ meaning a “dwelling” or “to dwell”. Good to know! All of our tipis are made from a combination of strong wooden poles, sourced from slowly grown spruce trees in the far north of Sweden, and advanced canvas materials, which makes them extremely durable during all kinds of weather conditions and in all four seasons. Please feel free to browse through and give us a call or send us a quick email if you need any advice. We’ll happily talk you through the best options. 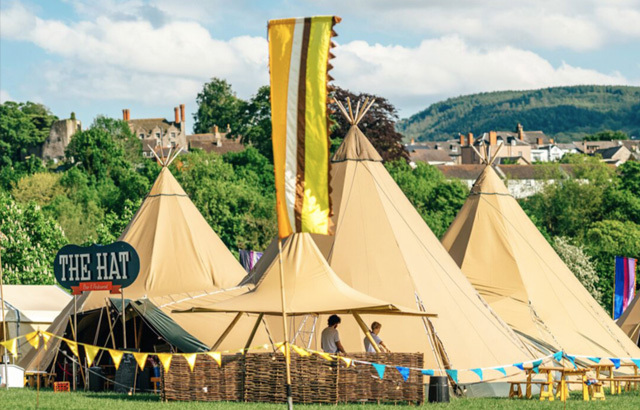 Largest of our tipis is the Stratus 72, aka 'The Giant Hat' which is the ideal base to build a large, spectacular venue from and is great for weddings, parties, festivals or corporate events. However, The Stratus 72 can also provide a single space suitable for smaller gatherings on its own. We will provide a full planning service for you. 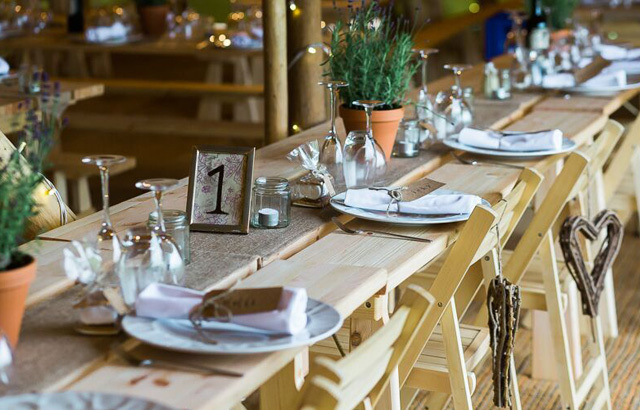 All you need to do is tell us how many guests you are having, and we will get started. The Stratus 72 is suitable for Weddings, Parties, Festivals, Corporate Events… just about anything. We can link any number Stratus 72 together to create a single covered space. There really is no limit to the size of event you wish to create. Typically, Allow for around 50 seated guests in a single Stratus 72. It is possible to accommodate more however we feel 50 ensures everyone is comfortable. If Standing is your thing, then a Stratus 72 will comfortably accommodate around 100 standing guests. 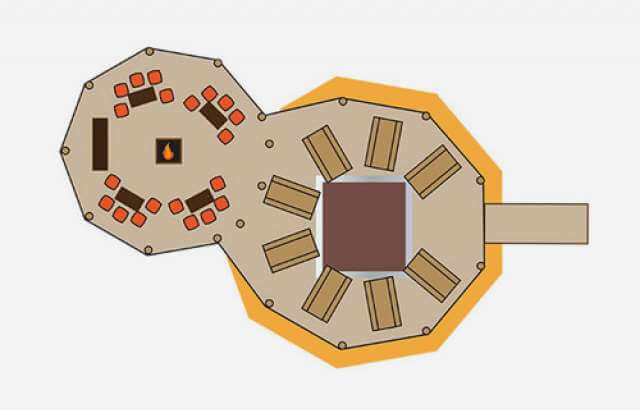 The Stratus 72 measures 10.3 metres in diameter with its sides closed and 13 metres in diameter with all of its sides open. Top to bottom measures just under 9 metres. This creates a sensational feeling of space and creates the unique atmosphere. If you're looking for something smaller, then perhaps the Cirrus 40 might be of interest to you. The Cirrus 40 is a smaller version of the TIPI measuring 8.5 metres in diameter and is often used as an attachment on our larger tipis and serves as the perfect 'chill-out' zone, but this tent can also be used on its own for a cosy, intimate gathering. The Cirrus 40 will seat around 20 guests. And up to 40 Standing. Please do call us or send an email with any questions you have. 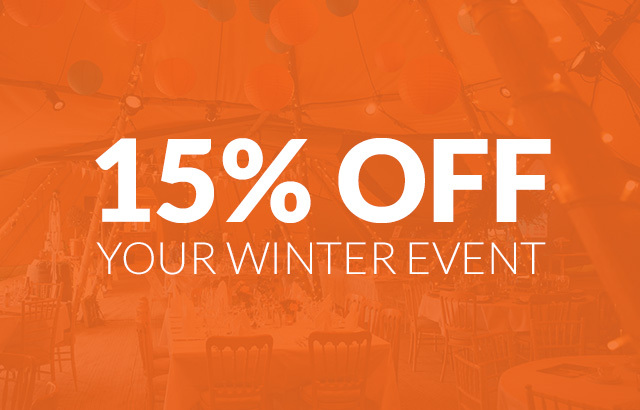 The Nimbus 16 is a great add-on to our Event tipi range – measuring in at 5.5m in diameter; it’s perfectly at home at a party, wedding or corporate event. It’s a great place to house your outside bar, or perhaps a place to serve up your hog roast or BBQ – a tipi that is truly versatile. The Nimbus makes the perfect chill-out area for lovely long summer evening and afternoons. The Nimbus will seat 12 people for that intimate Summer meal comfortable, or accommodate up to 30 people standing to shelter from that summer down pour or provide shelter at the outdoor exhibition. The range of its uses are limited only by your imagination. A great sheltered Chill Out area to relax on a lovely Summer Afternoon, what could be better. If your organising a Trade exhibition, why not use the Nimbus 16 in place of the traditional Gazebo, to ensure you stand out from the crowd, it really does provide so many creative marketing options. 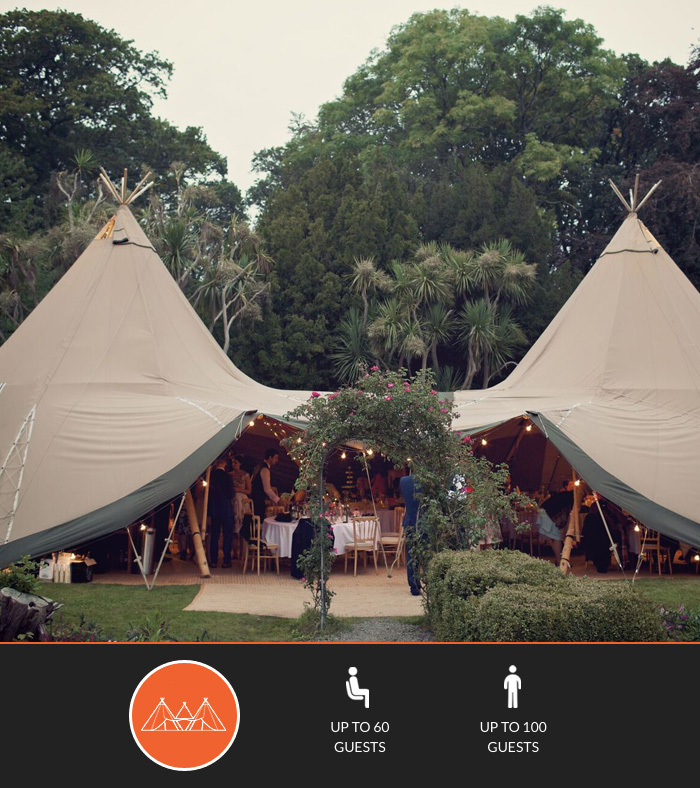 Alongside our range of bespoke tipis, we also have Pagoda marquees available to hire. Our newest addition, the Pagoda Marquee is primarily a bar tent, but can also be used for additional dance floor space, a photo-booth tent, or a relaxation space during a bigger event. 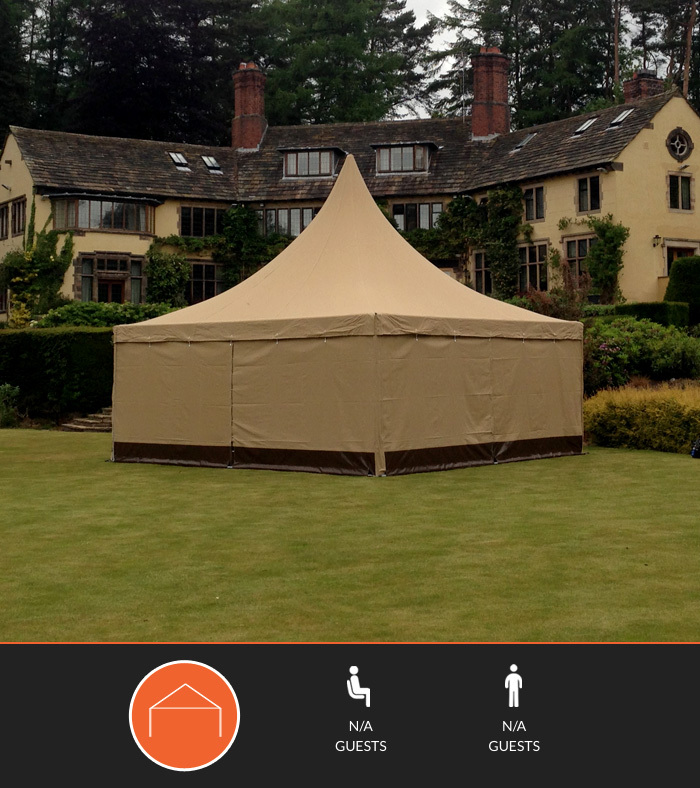 To get the wow-factor for your tipi or marquee, or just to create a little extra space, why not incorporate our Pagoda. 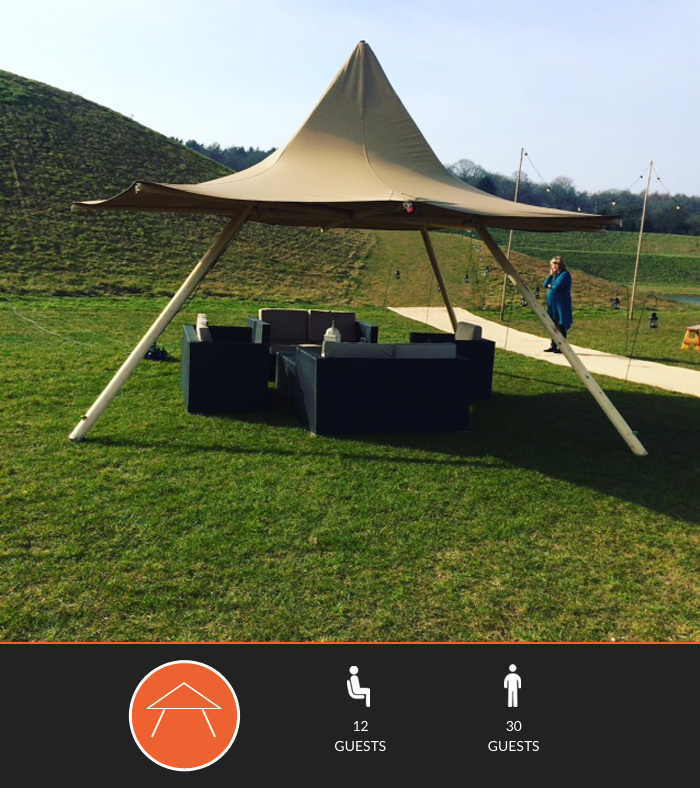 Used on its own or attached to the Tipi's it creates a fabulous bar are or shelterd seating / Chill Out area.The Pagoda can be connect to our tipis (Stratus 72) and adds valuable additional space, to use as you wish. If you have any of your own suggestions please do feel free to talk them through with us. We are definitely open to ideas, and the more unique the better!.